John BROWN (Hampton) (1589 – 1677 ) was Alex’s 10th great grandfather, one of 2,048 in this generation of the Miner line. John was married, but I do not know the name of his wife. John died 28 Feb 1687 in Salem, Mass. Many sources say his wife was Sarah Walker, but she was his niece and married John Tisdale. Either on June 27, 1675, as reported to the Plymouth Court by Shadrach Wilbore, or, or on April 4, 1675, as stated in a letter by John Freeman, an officer in the war. John Tisdale was killed by Indians. It was reported that three men were slain: John Tisdale, Sr., John Knowles and Samuel Atkins. John Tisdale’s house was burned as was the house of his brother-in-law James Walker. John’s gun was carried off by the Indians. The gun was retaken at Rehoboth on Aug 1 1675, where it was found with the body of an Indian who was slain there. The gun was later used as evidence in court. Sarah Walker Tisdale did not outlive her husband by much. She died on Dec 10 1676, in Taunton. John’s estate was settled on March 6 1677. That same day, three Indians: Timothy Jacked, Massamaquat and Pompachonshe were indicted for the murder of John and the other two men, on the evidence of having John’s gun. Charges against one were dropped for lack of evidence. The other two wre deemed probably guilty. All three were sold into slavery, and removed from the country. In June of that year John and Sarah’s youngest daughter, Abigail, only 14, was given into the guardianship of James Browne of Swansea. He may have been the son of her mother’s uncle, John Browne, but I don’t have him listed. In 1677 the Tisdale’s oldest son, John, committed suicide. He built the first ‘barque’ (small boat) ever built in Hampton, New Hampshire in 1641 or 1642 at the river near Perkins Mill. It would seem that this barque was the one that John Greenleaf Whittier features in his poem, ‘The Wreck of River Mouth’.” This poem expands on the true story of a Hampton shipwreck (click for original report) from 1657, when a group of eight were killed in a sudden storm. Whittier also includes the character of another of our ancestors Rev. Stephen BATCHELDER, the founder of Hampton, NH in this poem. The Browns River is named after John. It is a 2.9 miles long river, primarily tidal, in southeastern New Hampshire in the United States. It is part of the largest salt marsh in New Hampshire, covering over 3,800 acres. The river rises in the town of Seabrook just east of U.S. Route 1 and quickly enters the salt marsh and tidewater. For most of its length, the river forms the boundary between Seabrook and Hampton Falls. The river ends in Hampton Harbor, where it joins the Hampton River. He stayed in Salem until 1638 when he received one of the first tracts of land in Hampton, NH (4 acres) next to Browns River (named later for John). He owned four farms and became one of the wealthiest men in the area. Most genealogies state that Rebecca was born in Providence, RI. and some don’t include her in this family. This family lived up north in Hampton, New Hampshire. Either the birthplace is wrong or Rebecca had different parents. ” John Browne 40″ as well as “William Walker, 15; James Walker 15 and Sarra Walker 17, servants to John Browne, baker, and William Brasey, linen draper in Cheapside” embarked upon the Elizabeth;”, Mr. William Stagg, master, leaving London on 17 April 1635 and arriving in Boston, Suffolk County, MA in June”, according to Peter Wilson Coldham’s The Complete Book Of Emigrants In London, John was a Baker and was listed as such on the manifest of The Elizabeth. The master, John Browne, was a Puritan who followed his preacher, Reverend Stephen BACHILER , to New England to escape the oppression of King Charles. John became a freeman two years after arriving in 1635, then moved to Hampton, New Hampshire. First called the Plantation of Winnacunnet, Hampton was one of four original New Hampshire townships chartered by the General Court of Massachusetts , which then held authority over the colony. ” Winnacunnet” is an Algonquian Abenaki word meaning “pleasant pines”. The town was settled in 1638 by a group of parishioners led by Bachiler , who had formerly preached at the settlement’s namesake : Hampton, England . 16 Dec 1652 -[our ancestor] William SARGENT of Salisbury sold to John BROWNE of Hampton, the meadow and upland adjacent to Aquilla Chase and widow “Bristos”. John sued Thomas Swetman for a debt due “for two fat oxen” in 1654. John Brown was born about 1589 in London, England. He emigrated on APR 17 1635 from London, England. *Genealogy of John Brown : “He sailed out of London on the ‘Elizabeth’, 17 April, 1635.” He immigrated in JUN 1635 to Boston, MA. *Genealogy of John Brown : They arrived in Boston in June 1635 and he remained, as tradition says, in Salem, Massachusetts, until 1638. He died on FEB 28 1687 in Hampton, NH. *Genealogy of John Brown : “John Brown was born in London, England, in 1589 of Scottish parents. For several years he ran a bakery in London and at age fourty-six years decided to go to American Plantations. He sailed out of London on the ‘Elizabeth’, 17 April, 1635. “John was a sober, industrious, hard-working and enterprising man, having made purchases of large additions to his four acres of land in various transactions in the different parts of town. He became one of the largest land owners and the third man of wealth in Hampton, being owner of four farms. He bought of John Sanders in March 1645 house and houselot with 12 acres of upland in the north field next to Morris Hobbs, six acrea of fresh meadow lying by the Great Boar’s Head next to William Fifield’s meadow. Some genealogies say that John first had a son John BROWNE Jun born 4 Jan 1637/38 in Newbury Mass. But the consensus is that his parents were James BROWN and Judith CUTTING. Benjamin’s wife Sarah Browne was born 12 Apr 1658 in Salisbury, Essex, Mass. Her parents were William Browne and Elizabeth Murford, pioneer settlers of Salisbury, Mass. 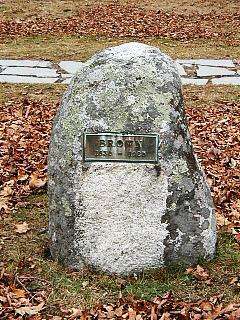 Sarah died 1730 in Hampton Falls, Rockingham, New Hampshire. Benjamin was a farmer residing on Rocks Road, in the southeastern part of the town, now Seabrook, NH, on land received by his father. Benjamin fought in King Phillip’s War, as did all his brothers. He was one of the signers of Weare’s petition in 1683, a selectman in 1690 – 1701 and 1711, and a representative in 1697. He was engaged in raising cattle. Tradition says that in his old age he took great delight, as he leaned on his staff, in seeing his oxen driven past his home to the watering place. 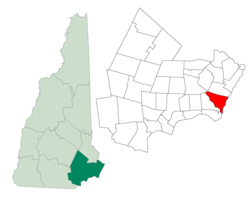 Elizabeth’s husband Isaac Marston was born 1648 in Hampton, Rockingham, New Hampshire. His parents were Thomas Marston and Mary Eastow. Isaac died 5 Oct 1689 in Hampton, Rockingham, New Hampshire. Isaac was made a freeman 26 Apr 1678, and he was a selectman in 1681. His farm was on North Hill, which is now part of North Hampton. In 1680, Isaac was bondsman for Isabella Towle, a Hampton woman accused of witchcraft. Joseph Dow’s History of Hampton Chapter 3 — Part 23 Isabella Towle b was a woman in her late forties, married, and the mother of nine children. Her husband, Philip, was first a seaman,” and later a “yeoman” of average position in the community. Beyond this the record does not speak. Particularly unfortunate is the lack of any material on the substantive charges against Goodwife Towle. All that survives is a court order, from September 1680, that “Rachel Fuller and Isabel Towle, being apprehended and committed upon suspicion of witchcraft . . . still continue in prison till bond be given for their good behavior of £100 apiece, during the Court’s pleasure. Both defendants were discharged in the following year. Godfrey’s wife and daughter, Sarah , deposed that Rachel Fuller came in with her face daubed with molasses, and sat down by Goody Godfrey, who had a sick child in her lap, and took his hand; when the mother, in fear, drew the hand away and wrapped it in her apron. Then Rachel Fuller “turned her about and smote the back of her hands together sundry times and spat in the fire.” Then she strewed herbs on the hearth and sat down again and said: “Woman, the child will be well;” and then went out, beat herself thrice with her arms, as men do in winter, to heat their hands, picked something off the ground, and went home. The next day, the children told their mother that Goody Fuller had said if they did lay sweet bays under the threshold, it would keep a witch from coming in. So they laid bays under the threshold of the back door all the way, and half way of the breadth of the fore door; and soon after, Rachel Fuller came about to the fore door, though she had always formerly come in at the back door, which is next her house; and she crowded in on that side where the bays lay not, and rubbed her back against the post so that she rubbed off her hat, and sat down and made ugly faces and nestled about and would have looked on the child, but not being allowed to do so, went out as she had come in, after having looked under the door where the bays lay; and she had not been in the house since. John Godrey, Nathaniel Smith and Hezron Leavitt made depositions, equally damaging. Elizabeth Denham (wife of Alexander), deposed that Rachel Fuller told her “Witches did so go abroad at night, they did lay their husbands and children asleep;” and she said there were eight women and two men in the town, who were witches and wizards. John Fuller became bondsman for his wife; and Isaac Marston and John Redman, for Goody Towle. They were discharged at the Dover Court the next year. Jacob Brown lived on the homestead in Hampton, New Hampshire. He was the principal heir to his father’s estate and was a deacon of the Congregational Church in Hampton, a patriotic and much trusted man. He served in King Phillips War and King Williams War. He was active in politics and was granted a liberty to build a Tide Mill on his property. Mary’s first husband Nathan Parker was born 26 Aug 1651 in Newbury, Essex, Mass. His parents were Nathan Parker and Susanna Short. His mother died in his childbirth. Nathan died 25 Jun 1685 in Andover, Essex, Mass. Mary’s second husband William Eliot was born 1654/55 in East Coker, Somersetshire, England. His parents were Andrew Elliot (Eliot) c: 24 Apr 1627 in East Coker, Somersetshire, England and Mary Vivion (Vivian). William died in 1721/22 in Beverly, Essex, Mass. Thomas’ wife Abiah Shaw was born Oct 1662 in Hampton Falls, Rockingham, New Hampshire. Her parents were Joseph Shaw and Elizabeth Partridge. Abiah died 21 Dec 1739 in Hampton, Rockingham, New Hampshire. Thomas ied in Hampton, Rockingham co., NH on 29 June 1744; he was 86. Thomas married Abial Shaw and lived in Hampton, Rockingham co., NH. Carolyn Depp’s research notes that Thomas’ age at death is 77 years. However, for that to be so either his birth or death record is off by ten years. Stephen was killed at Black Point (Scarborough, Maine) on Jun 29, 1677 during King Philip’s War. At the outbreak of King Philip’s War in 1675, Scarborough, Maine was an important coastal settlement with over one hundred houses and one thousand head of cattle. By 1676, the town had been laid to waste as a result of the war – some settlers were killed and others were taken hostage by the Native Americans. Subsequently, Massachusetts sent soldiers accompanied by Indian allies in 1677 to secure the town for resettlement. On June 29, 1677, while pursuing some Indians sent as a ruse, the company was ambushed by warriors under Chief Squando. In the New England militia of nearly one hundred soldiers, fifty to sixty were left dead or mortally wounded. Among the casualties was Captain Benjamin Swett. Called the Battle at Moore’s Brook, it was an embarrassing rout for the military. Early in the King Philip’ War, the Indians made a descent upon Captain Scottow’s garrison at the Neck, and captured it; and the inhabitants at once abandoned that locality. In 1677, two hundred friendly Indians and about forty English soldiers under Capt. Benjamin Swett and Lieut. Richardson, came to Black Point by water from Massachusetts. On June 29, Capt. Swett with a detachment from the vessel, together with a number of the inhabitants, swelling the force to ninety, set out to meet the Indians, who were lurking in the vicinity. In the neighborhood of the hill, they discovered a body of Indians in retreat, and pursued them. The flight was a ruse, and led them into an ambush. In the desperate fight that ensued, all but thirty were left dead or wounded on the field, Capt. Swett among the number. & I was sent by the first opertunitye to salem : where I came upon the 2nd of July : from tht time till the : 28th : of Janeuary I Remained under the hands of docter welds : as will appeare by his certeficate which I gave it to to [sic] the honured counsell. More English and friendly Indians from Massachusetts died in this one military action in Maine than at any other time during the war. It was a devastating blow to the colony and once again the men of Essex County bore the brunt of the casualties. Some of the wounded Essex men were shipped to Salem, where nineteen arrived on July 2. Others arrived in Boston. At Salem Dr. Barton and Dr. Welds, physicians of long standing, tended them. Some soldiers were paid for their service, others were not. They or their towns bore the cost of their medical expenses. Already feeling vulnerable, since four men were killed outside the town two weeks before and upon hearing the news, the Hampton town fathers wrote to the Governor immediately asking for a suitable replacement for their Captain Swett. Swett’s wishes were granted and his wife, Hester, was given twice her portion of his estate. She married Swett’s ensign the following March. The slain men were probably buried in a mass grave, which was a common occurrence during this and other Indian wars. A burying ground lay beyond the ferry and it may have been there where they were interred or they may have been buried close to the battle scene. In 1681, a great fort was erected at Black Point. After several attempts to rebuild between guerilla incursions during King William’s War, the survivors evacuated in 1690 and moved south to Portsmouth, New Hampshire. and Boston. A truce was signed in 1699 between the Province of Massachusetts Bay and the Eastern Indians. Resettlement of Scarborough started in 1702 when seven settlers arrived from Lynn, Mass. and construction began on a fort located on the western shore of Prout’s Neck’s Garrison’s Cove. This fort was commanded by Captain John Larrabee. 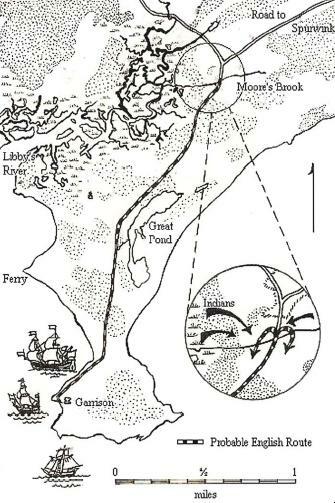 Despite the treaty, in August 1703, five hundred French and Indians under command of the Sieur de Beaubassin made a sudden descent upon English settlements from Casco Bay (Portland) to Wells. The fort on Prout’s Neck sat atop a bluff. When the French and Native Americans arrived, they were protected from gunfire by the overhanging cliff. They subsequently began tunneling into the bluff to breach the fort from below. Had it not been for a two-day downpour that made the disturbed bank slough, exposing the previously hidden excavators to snipers in the fort, the French and Native Americans might have been successful in their attempts to capture the fort and the eight people inside. However, Beaubassin retreated in search of easier prey. This entry was posted in 12th Generation, Artistic Representation, Historical Monument, Immigrant - England, Line - Miner, Pioneer, Place Names, Public Office, Sea Captain, Storied, Violent Death, Witch Trials and tagged "The Wreck of River Mouth", Battle at Moore's Brook, Brown's River, Hampton NH, Hampton Pioneer, John Greenleaf Whittier, Most Popular Surname, The Elizabeth 1635. Bookmark the permalink. I am interested to know where you found your records for documentation. All records and information I have found, including a book on the Tisdale’s show that Sarah Walker married John Tisdale I in 1640. This also includes information on findagrave. 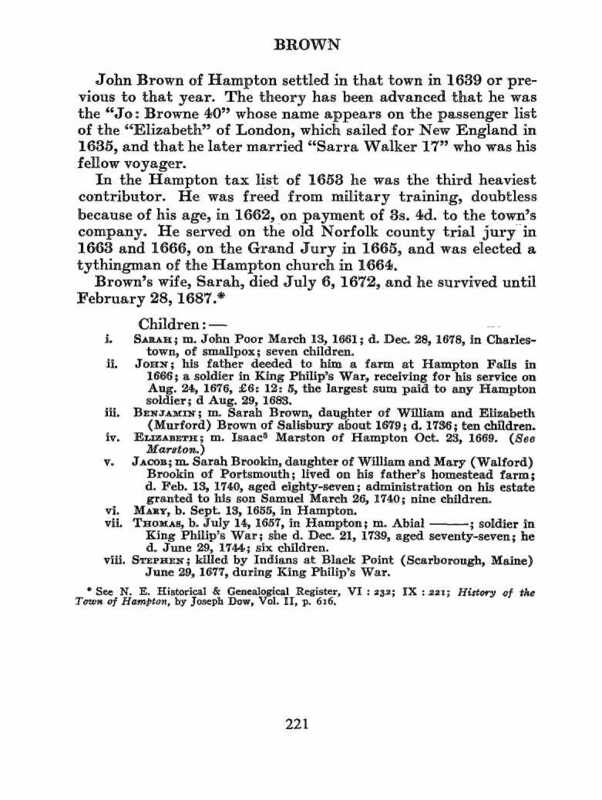 John Browne (Hampton) was Sarah’s uncle (not her husband) and possibly the brother of Elizabeth Browne Walker. (Sarah’s mother). I believe that researchers mistook your John Browne (1589) with another. There was a John Browne aboard the Elizabeth in 1635 with his NIECE Sarah walker and her brother. This Sarah is my GGM. She married John Tisdale in 1639. Not John Browne in 1640. I believe that your John Browne arrived on the Talbot in 1630 and he may have married a Sarah but not Sarah Walker. There was a Sarah Walker on board the Talbot as well but she was married to Robert Walker. There were however 14 passengers on board with the first name Sarah. Only one on the Elizabeth. I am afraid that ALOT of researchers have the incorrect information in their lineage. I have read other documentation as well and there is question as to Sarah’s last name. 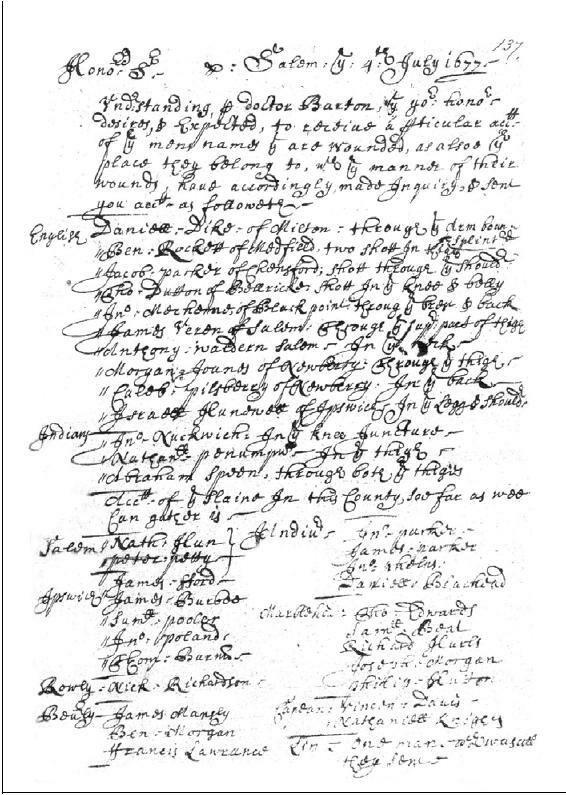 This is the information from the Talbot passenger list in 1630. The John Browne on the Elizabeth was bound for Plymouth. Not Salem. He was also Sarah’s uncle, not her husband. Thanks for the info. The temptation to add a last name in cases when we just have a first is strong. Was there a James Walker who was an assistant to a John Browne. I have five different Brown lines, I’m sure the Browns are difficult for a lot of genealogists, especially those with common names like John. on record in Nantucket a marriage, “John, [of] S. John and Sarah Walker, and Hannah Hobart , d. [decarled by] Rev. Peter, 2d, 6 mo. 1658 [june 2, 1658] This marriage was performed in Salem however. This is a very sought after marriage to have in ones genealogy since it adds the sought after Walker line, and the Hobart line (Hobart’s were on the Mayflower) so many genealogists have tried to include this marriage in with their books written in the 1800s. in order to force it, they have also often dropped the mothers name or Hannah’s last name. It is easy to find this marriage included in various books of genealogy in the 1800s in reference to any of the five prominent John Browns of the greater area. This leaves one John Brown of Ipswitch born Salem . (they are right next to each other like colonial versions of subdivisions. )John Brown of Ipswitch is son of a John Brown wife Hannah. The three theories (i have not already disproven) are that John Brown was born 1638 in Salem son of John Brown of Hampton who was still residing in Salem in 1638. (which coincides with what you have, with the exception that now there is a John Brown Jr. who eventually becomes sr). two, in the book Candlewood it claims that John Brown wife Hannah,’s father was Old John Brown wife Mary, but the book has two John Browns sons of two separate John Browns, one John Brown b. 1639 wife Mary (the Glazier the drunkard) two John Brown b. 1638 wife Hannah (the farmer) the problem with this is the earliest reference in the court documents (or otherwise) that refers to old John Brown’s Wife being Mary occurs in 1670 which is two years after John Brown the glazier married a Mary. other court records regard Old John Brown as widowed before and after 1670. leaving Candlewood wrong in claiming Mary to be the wife of Old John Brown, but rather she is the wife of The Glazier only. This gives rise to the theory that Old John Brown is the wife of Sarah Walker in the Marriage record 1658 of John and Hannah. leaving John Brown of Hampton married to a separate Sarah. theory three. is that Old John Brown wife Mary is actually the father of John Brown the Glazier, but they only started to call John Brown the Drunkard after he started to drink heavily, so in earlier records he is simply John Brown. this theory concludes with having John Brown of Hampton be the father of John Brown of Ipswitch which is why he has no parents in Ipswitch. One other difficulty is the large number of Hannah Browns whom a lot of people claim to be Hannah Hobart. (Collins and Hubbard being two) and another often repeated one is Hannah Browne, Rogers, Hobart. This is commonly claimed to be the Hannah Hobart married in 1658, but they ignore the father and mother listed on the record claiming him to be either son of James Browne of Newbury or son of John Brown the Elder of Salem. This Hannah Browne however was Born Hannah Browne, married a Hobart first, and then Married Rogers. these are just theories to explain what happened to John Brown in that marriage record I posted first. we can never really know what happened however, only that Sarah Walker did indeed have a John Brown (son of John Brown), whom married a Hannah Hobart. I think Robert Charles Anderson clearly shows that the John Brown who traveled on the Elizabeth in 1635 settled in Plymouth, later living in Reheboth and Taunton. His wife’s name was Dorothy. In a deed he mentions his relatives Sarah and her brother James. I have three John Brown direct ancestors and seven Brown ancestral families in all. Difficult to keep straight! thomas Brown (1657-1744) of Hampton, son of John Brown and Sarah Walker Brown, was illiterate. I have a document from Hampton, NH dated 1735 signed by him with a loop (fish?) type mark. In this document, he builds and sells a “hay Boat” to Ebenezer Good. Among his fellow passengers were Sarah Walker, age 17, (later to become his wife) and her brother, James Walker, age 15, who was formerly employed by John in the bakery. John Browne was Sarah, James and Phillip Walker’s uncle. Sarah married my ggf John Tisdale Sr. in 1644. It is also believed that John Browne was the brother of Elizabeth Browne Walker. Sarah’s mother. Thanks for the information. I updated this page. Do you know who John Browne’s wife really was? There was a Dorothy, but I think she married another one of my John Brown ancestors. So confusing these John Browns – lol. I read a little about John Tisdale. One source says that after John was killed in King Philip’s War and Sarah died, their youngest daughter, Abigail, only 14, was given into the guardianship of James Browne of Swansea. The source said James was the son of her mother’s uncle, John Browne, but I don’t have him listed.